Easy and fluffy, healthy greek yogurt pancakes you can whip up in a hurry! Preheat a pan or griddle to 325 (medium heat). Whisk together flour, baking powder, sugar, and salt. In another bowl, mix oil, eggs, vanilla, and greek yogurt. Add dry ingredients to wet ingredients and stir. Stir in milk until all ingredients are combined - don't over mix, there should still be a few lumps. Grease griddle and pour 1/4 - 1/3 cup batter onto the griddle. Allow to cook for about 2 minutes or until edges begin to look "dry" and bubbles form in the batter. Use a thin spatula to flip the pancake over and allow to cook for a mother minute. Transfer to a platter and continue with remaining batter. 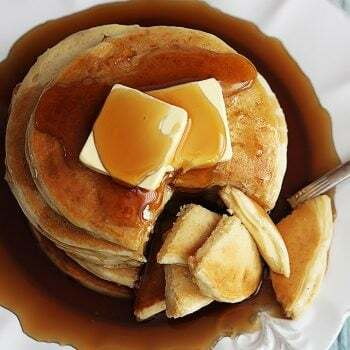 Top pancakes with desired toppings such as syrup, powdered sugar, honey, and fruit.